The RB5X Robotic System and accompanying robotics intructional material has proven itself as an effective system for teaching students the concepts of interactive hardware and software. All levels of students, from high school through university level graduate students, have utilized the proven approach to understanding automated systems. The training system has also been utilized by industries to teach their own personnel the fundamentals of automation. The technical student entering Industry with experience on the RB5X Robotic System as part of their training, has a step up on the competition. At the high school level, the RB5X Robotic System has proven itself as an effective student motivator. The System gives the students the opportunity to experience success early in their learning career. A large part of the early success experienced by the students is due to the RB5X System’s flexibility. When the students want to try some of their own ideas the system is capable of accommodating them. The System is also very forgiving of mistakes made by the students. At the university level, the RB5X Robotic System has been used to help undergraduate and graduate students develop skills in automatic process control. The System is programmable in “BASIC” with six eight-bit bi-directional data ports (48 I/O Lines). The technology for the RB5X Robotic System has been used to develop intruments and process control methods that has resulted in a patent for Illinois State University. A comprehensive vocational education teacher’s manual and student guide, edited by Dr. Larry Heath of Indiana State University, are now available. This material provides a full two-semester program, and can also be adapted to suit your own program. The RB5X has a built-in microprocessor. It is ver versatile and adaptable, and can be programmed easily. Using the classroom computer, CRT and keyboard, teacher and student can write programs for the robot and download them to the RB5X’s microprocessor. One of the RB5X’s special features is an interior card cage that allows for the addition of up to four circuit cards. This flexible design enables users to enhance their RB5X’s with special hardware and to make each RB5X one-of-a-kind. The RB5X’s “native tongue” is Tiny BASIC, a subset of the BASIC language that is both high-level and easy to use. In addition, RB5X can also use new “Conversational Language” RCL with SAVVY. RB5X’s interface panel contains a socket for preprogrammed or programmable modules. A switch allows owners to set the robot for modules of either 2K bytes or 4K bytes. A standard feature of RB5X is a 2K utility software module that contains a self-diagnostic routine (which automatically checks the robot’s batteries and motors) as well as several of the robot’s standard software routines. RB5X’s upper body contains a series of cutouts, covered by removable plastic caps, that accommodate hardware attachments, such as disc drives. Self-Learning: This small, first step toward true “intelligence” enables the robot to learn from its own mistakes. For example, you could set the RB5X down in a room and let it roam about randomly. It will probably run into walls several times, perhaps a desk, and maybe even a person. As it rolls around the room, it will “learn” in its own computer-like fashion where the obstacles are in a room, thus avoiding them in the future. The self-learning software are on “Alpha” and “Beta” levels, which were developed by the robotics author David Heiserman for the purpose of giving robots a simple way to “learn” from their experiences, somewhat like humans do. Tiny BASIC: This subset of the BASIC language is the means by which a person an communicate with the RB5X. Tiny BASIC is a subset of the High-level BASIC language, since many of the commands in BASIC aren’t essential to operating the RB5X. Sonar sensor: The robot’s Polaroid Rangefinder is able to detect objects in its path so the RB5X won’t be running unnecessarily into any obstacles. The sonar sensor detection can be set from a 10-inch to a 35-foot range. Tactile sensors: The eight “bumpers” that encircle the RB5X allow the robot to detect when it has encountered an object. These sensors are essential to the self-learning software mentioned earlier, since the robot needs to “feel” when it has bumped into something so it can learn where objects are located. The tactile sensors also help the RB5X navigate its way around its environment. Battery Charging: The RB5X can detect when it is running low on power. When it detects that condition, it uses its software to move about until it finds its charging “nest” so it can “refuel” itself without your having to be concerned with it. RobotLab ™ An RB5X base unit complete with materials above but without wheels and shells. Mounted on a board for teaching and experimentation, or use components to make your own mobile robot. The “Hop to It!” software module features an engaging, educational game that allows RB5X to use its sonar sensor to challenge players to accurately judge distance in feet and inches. When playing “Hop to It!” RB5X asks each player, in turn, to “hop to it” – to stand at a particular distance from the robot’s sonar sensor. RB5X judges how far away the player really is, tells him or her, and stores the player’s “error score” in memory. The closer the player gets to the distance RB5X requests, the better his or her score will be. At the end of five rounds of play, RB5X calculates the players’ scores, and announces the winner! “Hop to It!” can be played by up to eight people, or even by a single player, and is fun for both children and adults. The “Math Whiz” software module allows RB5X to quiz children and adults in the elementary math skils of addition, subtraction, multiplication, and division. “Math Whiz” is a math quiz in a game format that may be played by up to eight people at one time. RB5X uses its random number generator to compose a math problem for each player in turn, tells players if they have given the right answer to the problem, and gives the correct answer if the player is in error. Players score one point for each right answer, and after six rounds of play, RB5X announces the players’ scores. The competitive challenge of “MathWhiz” and the lights, sounds, and robot motions that accompany the game motivate children to learn important math skills with RB5X! “Record Time” gives new life to a good, old-fashioned foot race. RB5X gets the race off to a clean start with the sound of a starting pistol, and then times the event and forms an invisible finish line with its sonar. When a runner returns to the starting line and crosses the sonar beam, announces his or her time and prepares for the next racer. The robot keeps track of each runner’s score, announces the time at the end of each race, and broadcasts any new record set. “Simon Robot” is hilarious fun for all ages, and may be played by up to eight players. We recommend that you don’t start to play until you have time to spare — you’ll have a tough time walking away once you start playing! As a supplemental classroom activity, “Simon Robot” helps strengthen listening skills, demonstrates concepts of sequence, and rigorously exercises the memorization abilities of every player. The object of the game sounds simple enough: to press RB5X’s bumpers according to the sequence in which the robot speaks their corresponding numbers. If you are successful in pressing the bumbers in the right order, RB5X adds a new number to the sequence and asks you to repeat this new combination of numbers, trying to stretch the limits of your abilities. In addition to the basic game described above, we have added three variations (games 2,3, and 4). When you think you have mastered the game, try the most difficult version, Game 4, and be prepared for the real master, RB5X, to scramble your brain as you attempt to press bumpers as he directs! “DriveIt” allows the RB5X robot to be moved from place to place under its own power, avoiding the necessity for carrying it. Movement is controlled by pressing the various bumpers; depending on the bumper touched, the robot will execute a forward, backward, or turning movement. 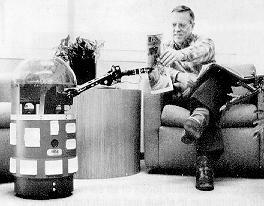 When a bumper is touched, the robot acknowledges by saying “Yes, Master”, before performing the function. The “Spin-the-Robot” software module contains a captivating game for young children. 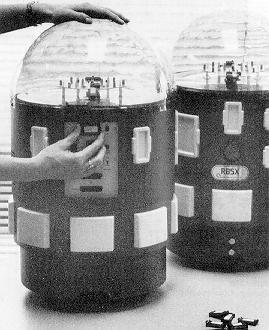 Place your RB5X in a circle of children, turn it on, and start the software routine by pressing one of the robot’s bumpers. RB5X spins, stops, and “points” to a child and tells him or her to perform a simple task. RB5X responds enthusiastically before spinning, stopping, and selecting the next player. Keeps children fascinated for hours! The “Pattern Programmer” software module lets you program any series of movements. You can instruct your robot to do a funny dance, spin in circles, or to follow a particular path around your living room. Each of RB5X’s eight bumpers corresponds to a specific movement command: forward, backward clockwise spin, etc. You use the bumpers to “play back” your pattern, to start RB5X dancing, spinning, or moving around the room! The RB5X Bumper Music” software module enables you and RB5X to make beautiful music together. To compose tunes using “RB5X Bumper Music”, you press the eight bumper panels like keys of a piano; each of the panels is assigned a musical note value by the software. When you have “keyed in” all the notes you want, you press a combination or bumpers, and RB5X plays back your tune. The “Daisy, Daisy / Intruder Alarm” software module combines two different RB5X programs in a single module. The “Daisy, Daisy” program allows RB5X to both sing the words to the song “Daisy, Daisy” (“On a Bicycle Built for Two”) and play the tune in two different octaves. The “Intruder Alarm” program allows RB5X to guard an area, and to teach you how sonar works! In “Intruder Alarm”, RB5X uses its sonar system to detect intruders moving within 35 feet in front of the robot. RB5X sounds as alarm or speaks one of three different phrases. The “Voice / Sound Demo” demonstration software module shows the versatility of the RB5X voice / sound synthesis card. The sound card can generate up to three different sound frequencies at once and has a separate noise channel. The “Voice / Sound Demo” features speech, music, gunshot sounds, a falling “whistle”, an alarm, rising “beeps”, clock chimes, and a series of musical tones. The “Carnival Barker” demonstration software module provides RB5X dealers who have shopping mall or other high customer traffic locations with an animated, awareness generated display. The robot portrays a charming android carnival barker and invites passers by to ask for RB5X information. NURSERY RHYMES The “Nursery Rhymes” software module allows RB5X to entertain children of all ages by reciting seven different nursery rhymes at the press of a bumper! This module is not only entertaining; it also provides children with a fun, friendly introduction to RB5X: The Intelligent Robot. Since its introduction, the RB5X Intelligent robot has seen several other uses besides education. Originally intended for education and experimentation, some people have used their creativity to make RB5X their own Personal Robot. As you can see RB5X has been used for some pretty interesting tasks. Below are a few pictures of RB5X’s use in the Past, Present, and possibly the Future! RB5X ready for a night on the town! 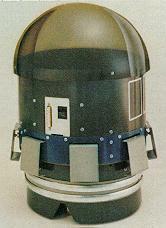 Here is an early RB5X with the Prototype Vacuum attachment. 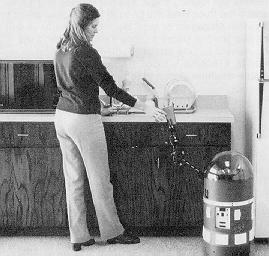 Vacuuming was one of the first tasks that a Personal Robot was going to be used for. Unfortunately, the navigation problems with the unit hanging off the back of the robot and extra weight made things difficult. 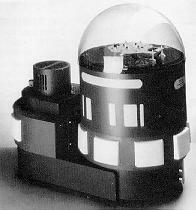 There was going to be another Prototype that looked like a larger Base with another ring of bumpers the the whole Robot would be bolted into. There just wasn’t enough demand at the time. 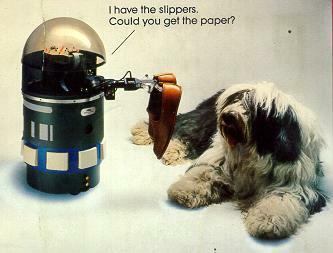 Little did everyone know at the time that robot vacuums would turn out to be so popular and now many of us own a Roomba or similar robot to handle this chore. 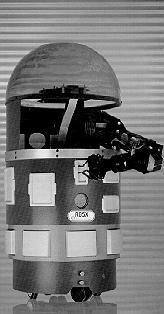 This early model had a solid shell, but the later RB5X robots had actual cutouts for future options and expansion. 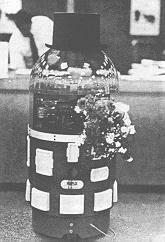 This is a picture of the very first RB5X robot. It is smaller than the production RB5X robots and I have heard that there were only a two or three of these made. These first prototypes were all hand made! They aren’t as expandable as the production model but they are very special pieces of robot history. RB5X: The Intelligent Robot, RobotLAB, and RCL-Robot Control Language are trademarks of RB Robotics / General Robotics Corporation.